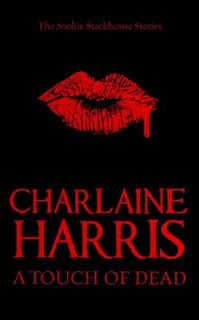 WARNING: Below there will be slight spoilers for some of the happenings throughout the Sookie Stackhouse series as the short stories take place at various times before and after the different books. A Touch of Dead collects together all 5 of the Sookie Stackhouse short stories in one book, previously otherwhere published, and I will go through and review the stories one by one. This short story didn't work for me at all. It takes place after the events in Dead to the World and is about the murder of Claudine and Claude's triplet sister, Claudette. Sookie is taken to their house where she must use her mind reading abilities on 3 captives to point out the murderer. The story dragged on and there was absolutely no suspense whatsoever. It tries to pretend that it's a Sherlock Holmes novel, but alas, it is not. This story takes place before Dead as a Doornail and in it Sookie is invited to a party at Fangtasia in celebration of Dracula's birthday. Eric is all over the place, fervently hoping that Dracula will make an appearance. This was quite a good little story, far more interesting than the first and more captivating. The ending was a bit weak, and it feels more like the chapter of a book than a (more or less) independent short story, but still a good read. This one baffled me a bit because [SPOILER WARNING - Definitely Dead] it tells of how Mr. Cataliades arrives to inform Sookie her cousin Hadley has died. It took me a little while to remember that we are only told in hindsight of that meeting in the 6th book. It was well enough written, and especially in the first part I almost felt like I was back in the book series and was quite happy to be so. Lucky is another wannabe Sherlock Holmes story. The plot and action taken, however, is far more imaginative and entertaining to follow. It doesn't have much to it, but it's good. Set after All Together Dead, we follow Sookie and Amelia on the hunt to find whoever is sabotaging the town's insurance agents. This particular story takes place before Dead and Gone and is a somewhat firm reminder that these books are labelled as paranormal romance for a reason. It's Christmas and Sookie saves a wounded werewolf who in return gives her a satisfying "gift". Now I'm not a fan of that stuff but as usual it's only implied, and I actually really liked this short story - right up until the last few pages which not left me sitting there with one eyebrow going up. I think, in summary, that it can be said, that some of these could have been done without really. They seem like chapter drafts that didn't make the cut. Some are quite interesting and it's both fun and nice to revisit the inhabitants of Bon Temps. Some can be read almost independently of the books, and some make no sense without having read the series. "Some are totally lighthearted, and some are more serious, but they all shine a light on a little facet of Sookie's life and times that I haven't recorded in the books. I hope you enjoy reading them as much as I enjoyed writing them." On another note, my thoughts on the book's original cover and the rest of the illustrations and artwork of the Sookie Stackhouse series can be found here. My review of Dead in the Family (book 10) by Charlaine Harris can be found here.